In the 10th Virgil Flowers novel, Virgil returns to Trippton, Minnesota, to dig into twenty years’ worth of traumas, feuds, and bad blood after a woman is found dead in a block of ice. Deep Freeze is the 10th novel in the Flowers series, and as always, Sandford devises a bizarre plot for his hero to untangle. Set in the winter chill of the northern Minnesota town of Trippton, the novel is both a murder mystery and a satire of small-town life … Flowers’s adventures are a riot, in part because of the author’s belief — which he shared with me — that most criminals are remarkably stupid. Sandford...details the investigation into the circumstances of Gina’s death with both empathy and intelligence. And above all, he infuses the proceedings with the sense of humor that has become a hallmark of the Virgil Flowers series. The humor that permeates Deep Freeze is impressive in its range, from innocent dad jokes to the blackest humor, from the lowest form of scatological references to Elizabethan literature callbacks … Deep Freeze is a wacky but heartfelt look at murder and mayhem in the Minnesota cold. For all its wry bluntness, it’s a gracious novel that doesn’t condescend to any of the characters it depicts, no matter how hard-up, self-sabotaging, or unlucky. Typically, authors write crime novels in one of two ways. Either the reader knows who the bad guy is before the protagonist, or they’re in the dark along with the lead character, trying to solve things and connect the dots as the story unfolds. Sandford shakes things up here by mixing both formulas, which pays off in the end. Readers might know more than Virgil Flowers, but they don’t know everything. Sandford uses that intrigue, and the reader’s quest to discover the whole truth will propel them forward, where he has plenty of twists (and more than a few laughs) planted along the way. 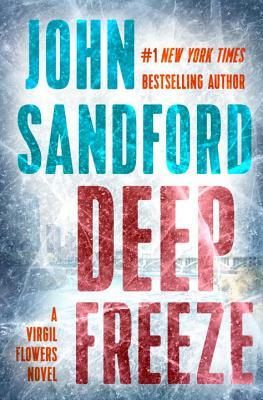 What did you think of Deep Freeze?